As the title of thread sums up, I bought the trimmed Authentic Props build from Mark. This is my first build, and I've decided to go for the Centurion designation because.. well, it sounds awesome.. and if I'm going to put in a lot of work to get into the 501st, I may as well put in a bit more and go for the level 3 designation. Because I live in a tiny place right now, my strategy is to remove all of the pieces I need from the box ONLY for the specific part I'm working on, and just work with those. Once done, I'll do the same for the next piece, and so on and so on... I'll unbox all of the pieces that came in the box for that part, then I'll point out which ones need to be modified/removed/ignored. I'll also point out what additional things I bought for them. Hopefully it makes it easier for people to follow along, and to also point out if I am doing something wrong. I'll do my best to keep my main posts organized, and I'll edit them to include all of the best information I learn at each step, either as I learn from my mistakes or from all of you. - I believe I just need to put it all together with the materials I have. 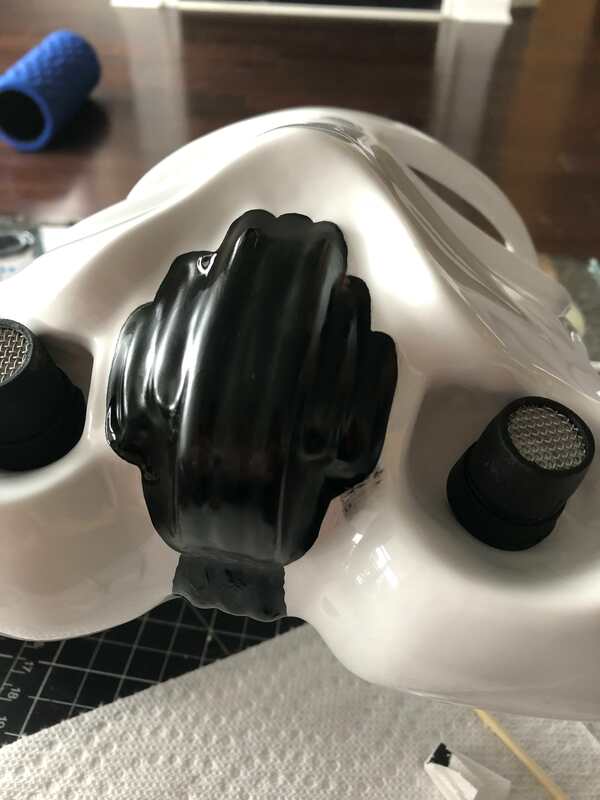 - I originally thought I didn't have the correct "Hovi mics" as I read some other threads from people using AP's kits, BUT, thanks to the help here, it turns out that I do. I guess I was reading some older threads before they shipped with the Centurion quality Hovi mics. You can see the post/replies below around this. - Other than some additional small bits of paint on a bump, I'm going to need to buy an S-Type next trim, and I guess, ignore the one shipped to me. - For those that don't know, the neck trim is that long black rubber thing curled in a circle in that photo. There's a smaller one for the brow, and a longer one for the neck. I guess the neck one needs to be a different style that looks more rounded in the end. I did some early digging and I can't seem to find it online at any hardware store here. 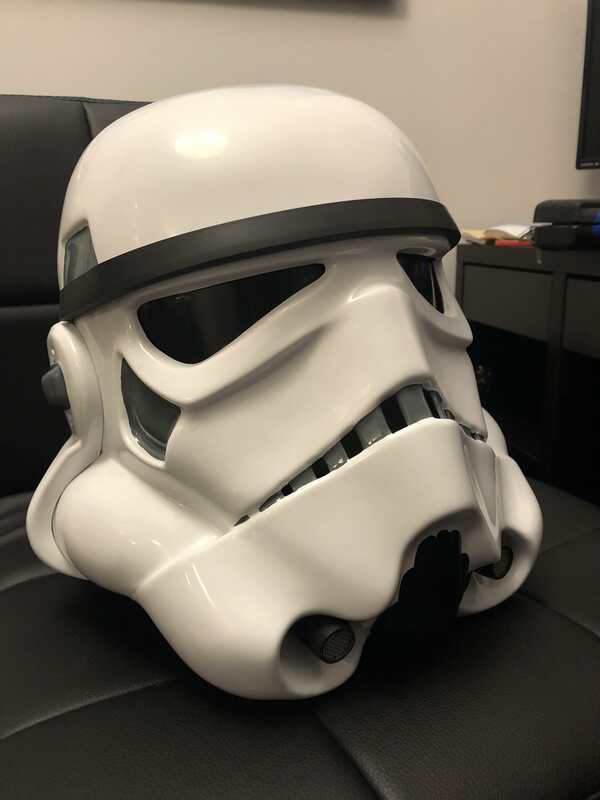 I know many people order them at specific trooper sites, but I feel like this should easier to find. I've found "window seals" and "s-style rubber" that returns some decent search results, but nothing perfect and accessible. I'll update this once I make my decision and buy it. 01. Just one for now; Level 3 certification says that "Tears/traps shall be hand painted or use decals that emulate hand painted (with correct ANH TK details)", and from the kit I ordered, it looks like the decals do just that, however, after looking at a few threads of those going for Centurion status using the AP kit, they all seemed to hand paint them. My question is "Are the decals for this kit adequate? or do I need different decals? or should I just hand paint it?" A. I was told that the decals will actually work for Centurion certification. Most people just paint them because that's how it was done in the films. I received a suggestion to try painting them, and if I screw up, then to use the decals overtop of it. That works for me! - I still don't know the best place to buy the neck seal, however, the Centurion level submissions thread requires everyone post where they got their parts from, so I think I'll go through that and see what the majority of the Canadians did. - I'll paint the helmet and use the decals to cover them up if I screw it up. The decals are good enough for Centurion. 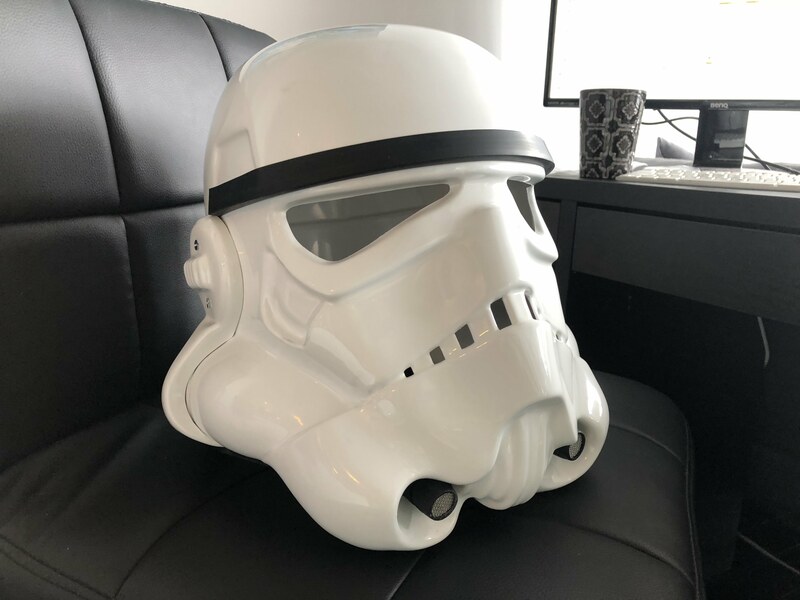 - It was really easy to assemble this helmet! Only took about 15 minutes (and hours of research). I'm excited for the next step! This weekend I went out and bought the Humbrol paints (Suspend was kind enough to give me his extra French Blue!) 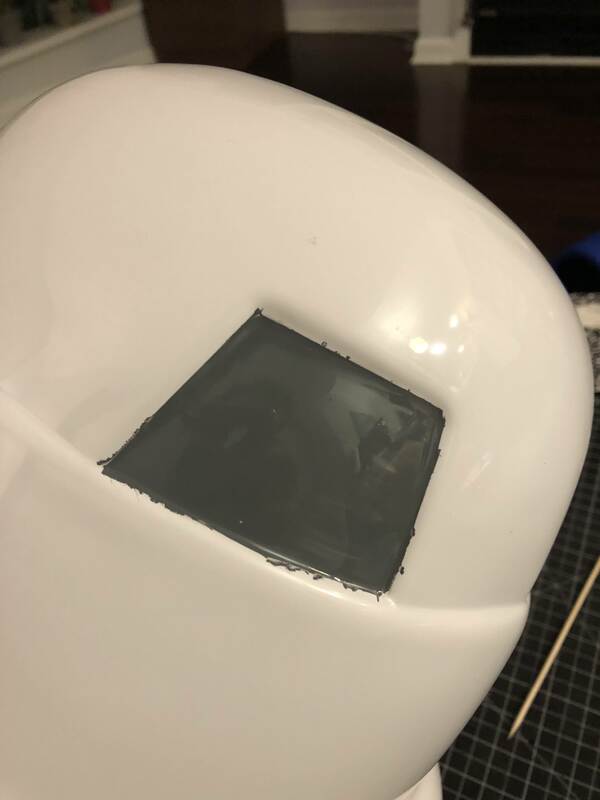 and I did my first layer of paint on the helmet. 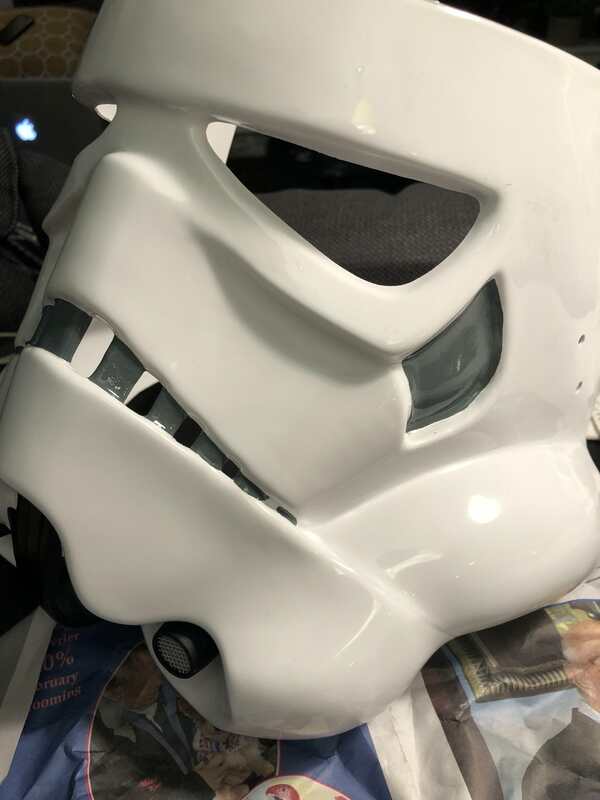 I didn't end up doing the the tube stripes, as those seem the toughest, so I'll get to those after the rest of the paint on the helmet is finished. The decals that come with the AP build are really hard to peel off. I even had to post about it below because I thought maybe I had to glue them on. Thanks again to Suspend for clearing that up. I also realized afterwards that it is because they are vinyl stickers, so they are VERY thin. If you do wet the back of those stickers, the paper comes off more easily, but just be careful. Second thing about the decals is that I found them to be too large for the traps. The tears were well sized, but the traps seemed to run over the grooves. I originally wanted to create a stencil out of those decals, but because it all didn't add up, I just looked at the Centurion submissions and then freehand painted it.. which brings me to lesson number 3..
Freehanding it is way easier if you don't try to put painters tape around the edges! I tried putting tape around the edges but it all bled underneath it. Below you can see a freehand example vs the taped example. Mineral Spirits is amazing! If you're at all worried that you're not good at painting, just buy this stuff and some precision q-tips and you can fix anything! I accidentally put too much on the vocoder and it ended up running down the chin on the side. Trying to clean it up with paper towel smudged it, so I used Mineral Spirits and it was much better. I ended up cleaning up all of the traps too. Tomorrow I'll do my second layer on the traps, tears, and vocoder. Thanks for reading! I've done the second layer of paint for the gray and the chin. It's not perfect, but when I put the black outlines on, it should cover up the imperfections around the edges. I found the thin layer technique works much better, and also gives the satin black and less glossy end result. It also dries much faster. Freehand is still better than stencil, in my opinion. Update September 25, 2018 - The Lenses! The moment I got my green welder's shield, I had to throw it in the bucket to see how it would work and look! For all you Canadians, I bought this for $12 CAD on Amazon and it ships with Prime. It's big enough to get 2, maybe 3 strips for the lenses out of it. Here is the Green Welder's Shield item on Amazon. I left the film on because I'm going to be taking this thing apart several more times before it's ready. Use Uswrath's thread to see how it's done! It takes some time to mark the drill holes, but be patient. If you buy this product from Amazon, you'll have extra material in case you screw it up. Welcome, and GREAT to hear that you are aiming for Centurion! Here are some answers that may help, but always feel free to ask as many questions as you like! 1. "What I'm finding a bit difficult is if level 3 certification is something that happens on top of level 1 or 2, or if there are times when I skip certain items in the level 1 and 2 checklists and just jump to level 3." Always build to level 3. 2. "I should have all of the proper materials except for the "Correct 'Hovi mic' aerator tips." I believe AP's hovi tips are good to go, as long as the inside is white and the screens are correct. If you can post a close-up pic we can let you know. 4. "Just one for now; Level 3 certification says that "Tears/traps shall be hand painted or use decals that emulate hand painted (with correct ANH TK details)", and from the kit I ordered, it looks like the decals do just that, however, after looking at a few threads of those going for Centurion status using the AP kit, they all seemed to hand paint them. My question is "Are the decals for this kit adequate? or do I need different decals? or should I just hand paint it?" The decals that you have will do just fine for all levels. You will need to paint the ear bars/teeth yourself, though. If you have the time and talent, I always suggest painting everything yourself, though. If you decide to do that we can offer some tips! Bets of luck on your build, and as mentioned, ask lots of questions and be sure to add as many detailed photos as you can. after looking at a few threads of those going for Centurion status using the AP kit, they all seemed to hand paint them. My question is "Are the decals for this kit adequate? or do I need different decals? or should I just hand paint it?" It's great to see how much research you have already done into EI and Centurion. That's a great starting point for a build. Regarding the painting on the helmet, it can be very rewarding to hand paint your lid. Most tend to use a stencil for the blue tube stripes on the 'cheeks', with the other part painted freehand. Although, there are also stencil/templates around for the traps and tears (the grey bits) so the options are there to suit the individual. As you already have the decals, you could perhaps try hand painting and use the decals as a fall back? As per the CRL, Tears/traps shall be hand painted or use decals that emulate hand painted (with correct ANH TK details), so either of these is allowed. Welcome aboard and good luck on your build. Your reply was amazing and I almost quoted the whole thing. I'll look at that S-Trim, but I'm still going to see if there's any way I can get it in Canada. I hate paying duty fees. As for the decals, I'm going to leave those until the end, as I may decide to paint it instead, but thanks for clarifying that they'll work for Centurion. Biggest thank you goes to that link you sent me. That is definitely going to be my main research source now. Yeah, this makes total sense. I think I'll end up painting them as well, or maybe ask my girlfriend to do it as she is quite the arteeeste. It does really take it to that next level of badassery! I'll keep that in my back pocket as that's a great tip, thanks! YES! That is a great suggestion too, and makes total sense! And thank you everyone for the support already. This is already fun and I've done nothing for my build still heheh. As I'm going to try to keep my main progress posts contained to one post per part, I'm going to update that post with the information I've learned from you all. 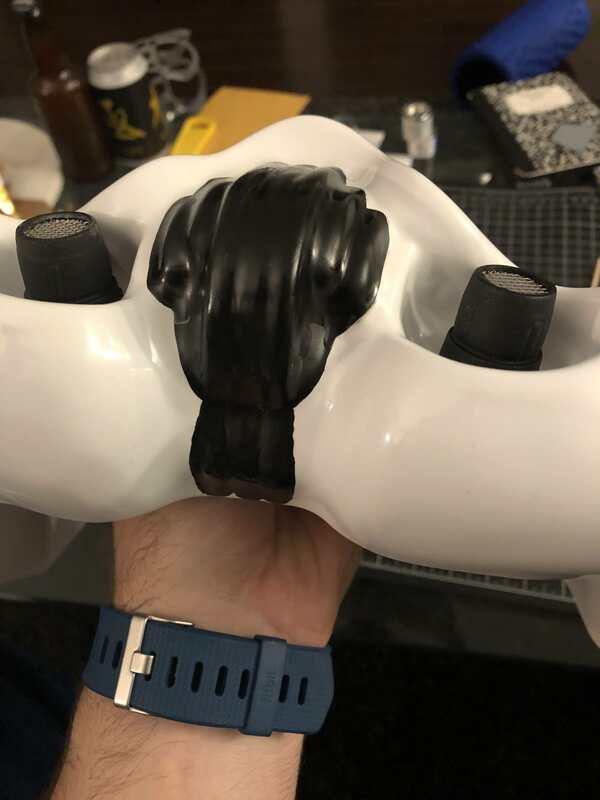 , "...it DOES look like my Hovi mics might actually be good for Centurion, but if someone can please confirm, that would be great! Here is the pic of what I have:"
You are good to go, sir. Hi there, where are you located in Canada? You should join your appropriate garrison's forums if you haven't yet. There could be armour parties in your area that could be very useful. Think everyone has answered most of your questions. Regarding the S-trim, I have looked at a lot of places with no luck. If there is an auto parts shop (Princess Auto here) then you may have luck finding something. 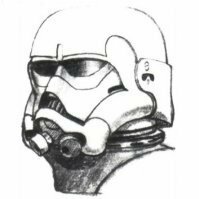 Oh, and one small tip for when you put those tube stripes on: they should "lean" towards the front of the helmet, not towards the ears, and they should sit a pencil's width away from the cheeks. I had some time today, so here's where I got! Thank you everyone for the helpful hints and tips! 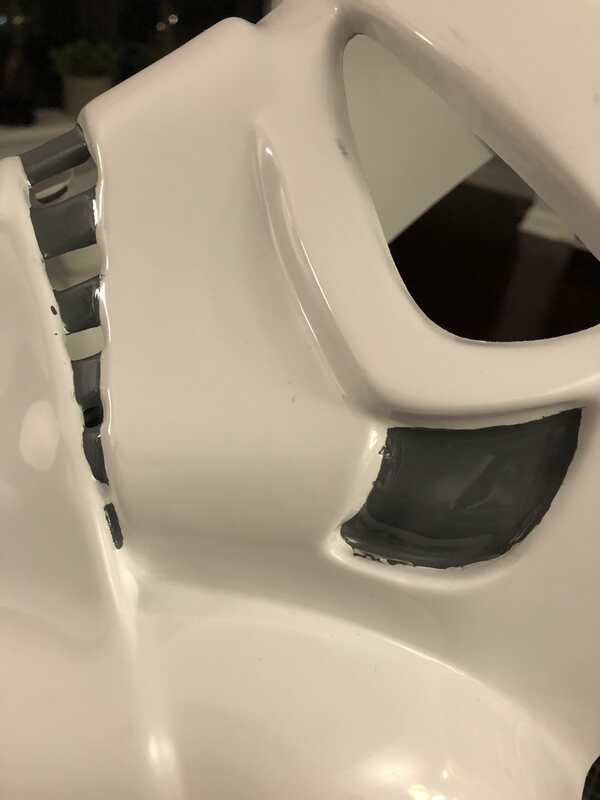 There was another thread I was reading where the guy had troubles closing the gap between the helmet and the ears, but mine looks pretty good. AP's trimmed kit really works well and this only took me maybe 15 minutes (after hours of reading though). Thanks justjoseph63 for confirming that the Hovi mics shipped with my AP kit are already Centurion quality! 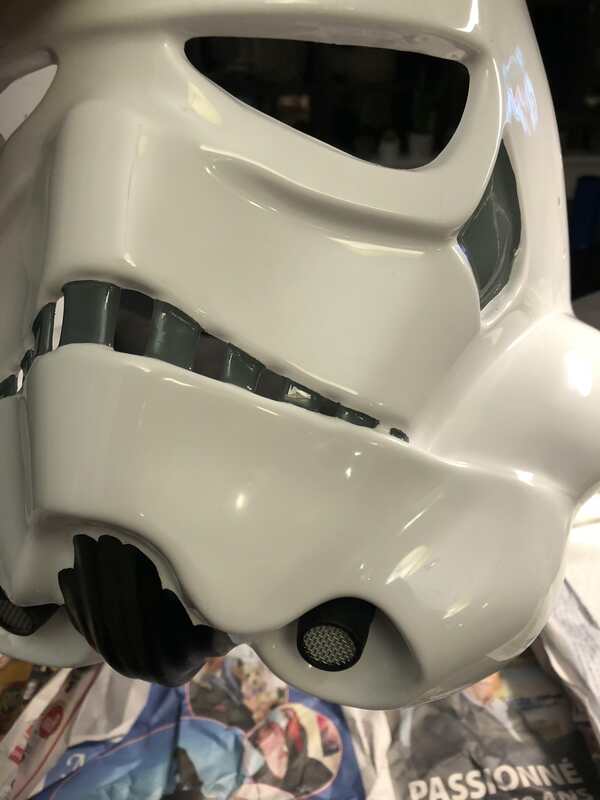 one small tip for when you put those tube stripes on: they should "lean" towards the front of the helmet, not towards the ears, and they should sit a pencil's width away from the cheeks. 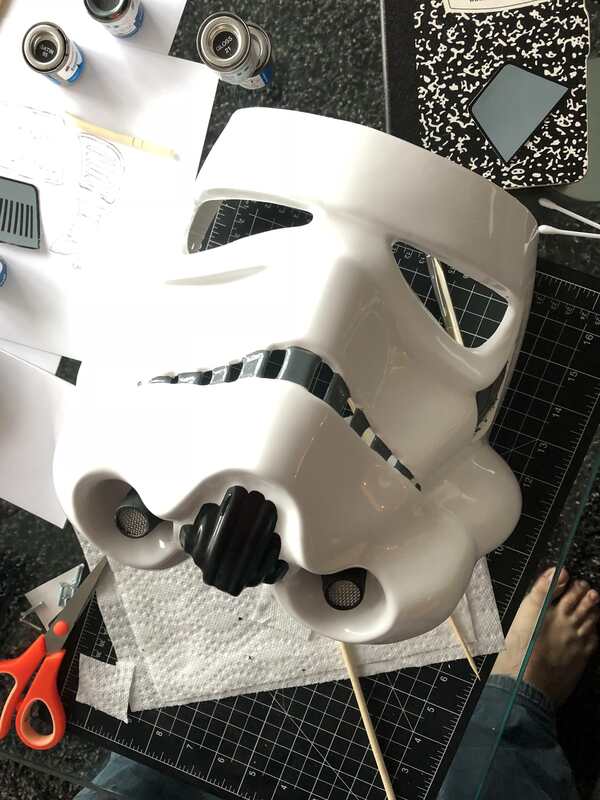 I was planning on painting it last... but I kind of want to finish the helmet completely before moving on... hmmm we'll see what happens! Yes fantastic job on the ears. I'm trying to find the right lens material for Centurion. I know I can buy the lens material right from Trooperbay, but it's 2.5 inches tall by 15 inches wide. I was hoping that I could find a larger cut of it that's about 5-6 inches tall and maybe about 20 inches wide. 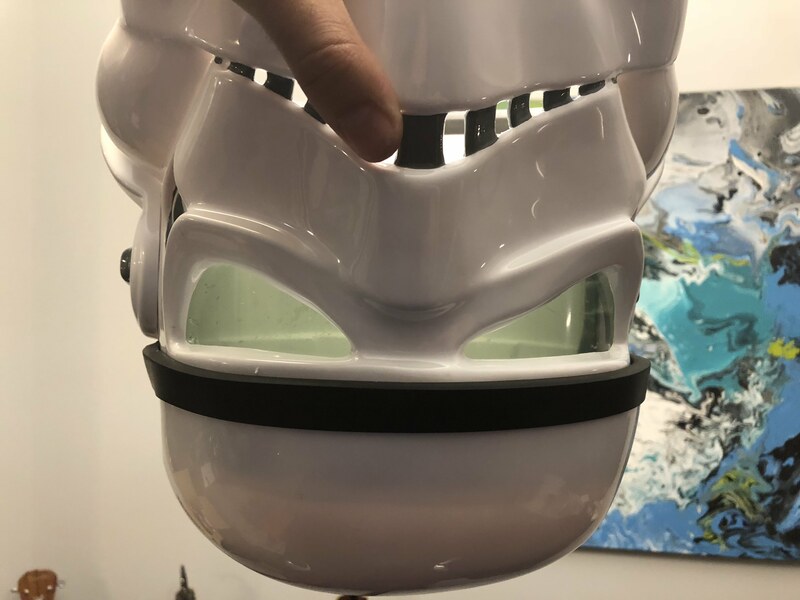 The reason for this is because then I can use it for my Stormtrooper lenses, plus have room in case I screw up, but MAINLY because I'm also building a Green Ranger helmet and could use that as the visor material. I was hoping to cut costs and save on shipping and all that. Anyone know what search terms I should be using online? "Dark green lens material" only gets me so many hits, same with "welders shield material". Welder shield is correct. Mines from home depot or princess auto, as back up. Ata supplies it. When painting using stencils, paint a layer or two of white first and let dry. Then, paint the blue. If using humbrol, it needs. To. Be. Mixed. Crazy. Lots. Well. When you think its stirred enough, stir it more. Then more. Then a bit more. Then paint. I use chopsticks or wooden stir sticks. Try searching "face shield replacement lens"
Thanks for the tip. 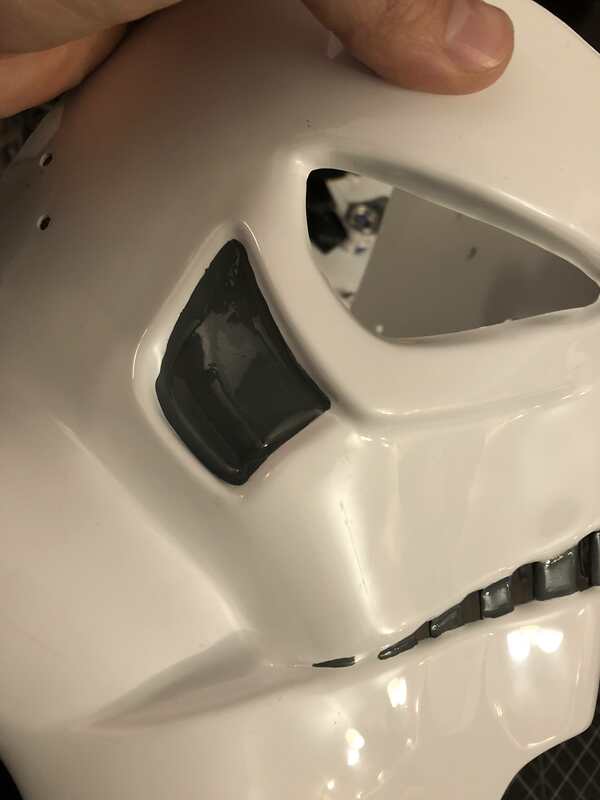 I can only find clear face shields on the home depot site. But I'll check Princess Auto online if possible. 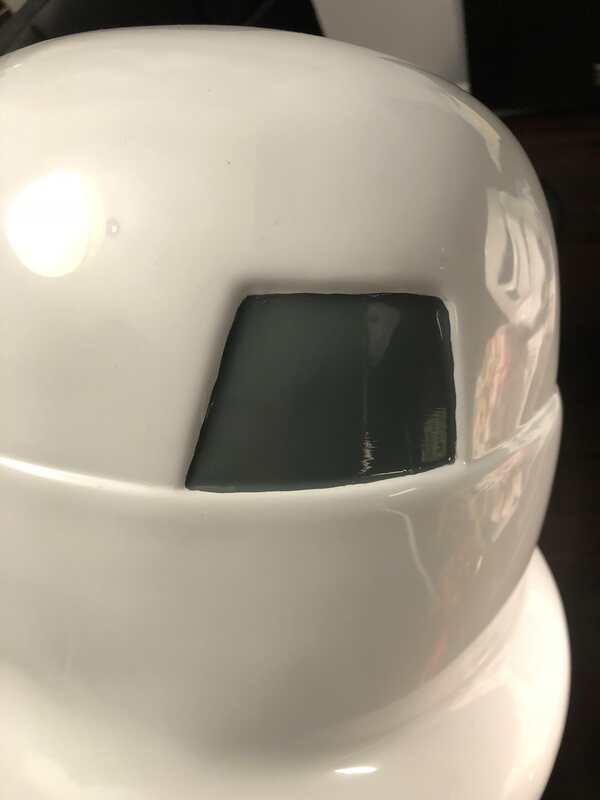 Try searching "face﻿ shield replacement len﻿s"
Thanks! I found several hits with that, and I actually think I found one that may work, and it can be delivered with Prime.. Do you think this one would work? They are water transfer decals if I recall. Sort of like the ones you get for models if you've ever built them. Not any regular stickers I've heard of used for kits. Of course I could be wrong, but I don't think I am. Negative, the AP ones are regular "sticker" stickers. People use water to help position them so they don't just attach to the ABS right away. It took me several attempts to peel them off the paper. The paper kept tearing so I'd move to another corner and eventually the vinyl sticker would lift. Well I got to learn something today, thanks for clarification I didn't realize there were any regular stickers out there. Thanks so much for the info. I ended up just freehand painting it all for today. I updated my main post above with my progress! Quick update - I've done the second layer of paint for the gray and the chin. It's not perfect, but when I put the black outlines on, it should cover up the imperfections around the edges. I found the thin layer technique works much better, and also gives the satin black and less glossy end result. I'll add these to the main post above too. Thanks for any tips and feedback in advance! 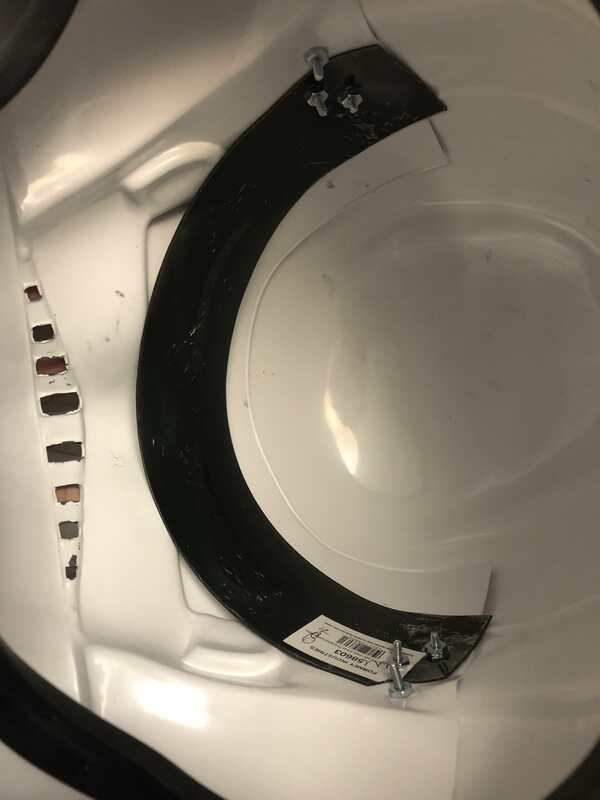 I was away for awhile, and when I got back home I found my green welder's shield waiting for me so I had to throw it in the bucket to see how it would work and look! For all you Canadians, I bought this for $12 on Amazon and it ships with Prime. It's big enough to get 2, maybe 3 strips for the lenses out of it, but I'm using the other 2/3s for my Green Ranger helmet I'm also building. Here is the Green Welder's Shield item on Amazon. I will update my main helmet post above with this information. 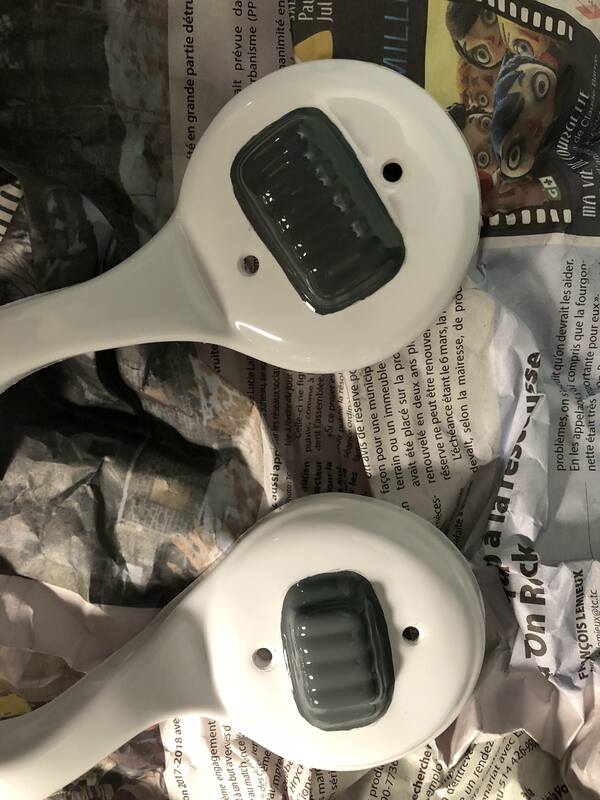 My next steps are to finish the paint!